From a simple set of taps for your basin to a complete bathroom installation give 1st Clearflow a call. 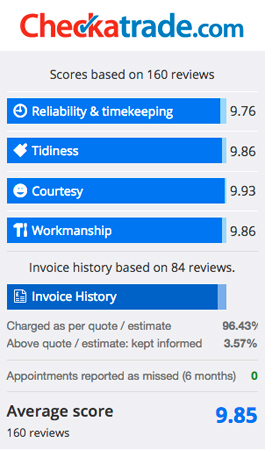 Every job is highly valued and our number one priority is customer service. Bathrooms are more than just a simple, functional room; they should be a practical place for you to relax and indulge in elegant and stylish surroundings. 1st Clearflow strive to bring you the highest standard of work with a balance between attractive aesthetics and contemporary comfort for the perfect installation of a beautiful bathroom. Depending on the style of bathroom you require there are usually different ranges available to help create everything from extravagant bespoke bathrooms to a small but beautiful budget bathroom tailored to your every need. We offer free quotes and consultancy on all projects, whether large or small. Our expert bathroom fitters and plumbers install to the same high quality standards everything from custom made & bespoke baths, showers, sinks and W.Cs to simple budget contract bathroom suites. 1st Clear Flow offer the complete bathroom installation service and cover the following areas: Brighton, Hove, Shoreham, Lancing, Worthing, Littlehampton, Horsham, Crawley and throughout the whole of Sussex. Give our specialist team a call on 01903 238812 or contact us on our contact form above and one of our team will be in contact soon.